The mutilation and death of a pet rabbit could be the latest work of the "Croydon cat killer", it is claimed.The dismembered body of rabbit Teddy was found by his owner in his cage in her garden in Harpenden, Hertfordshire.Animal charity Snarl, which is investigating hundreds of violent UK cat and rabbit deaths, said it thought the pet was victim to the same killer.Hertfordshire Police said officers were examining whether the death was linked to the wider inquiry.The rabbit's owner, who wanted to remain anonymous, said it was "beyond comprehension" that "someone, somehow, climbed into our high-walled garden, killed and mutilated him and left him next to my daughter's little pink Wendy house for us to find". 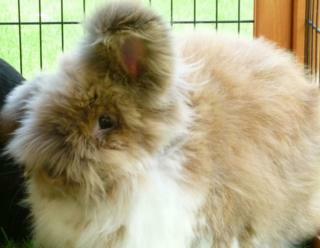 The lionhead rabbit, whose body was found on Tuesday, was "one of a kind, truly special", she added. Charity Snarl (South Norwood Animal Rescue and Liberty) said it was "currently investigating what seems to be a spate of attacks across the south east on cats and rabbits".Last week, the Hertfordshire force confirmed officers were linking the death of a cat in Potter's Bar to the "Croydon cat killer". Taz's injuries were consistent with those of other mutilated cats and small animals found across the UK, leading the force to believe the deaths are linked.The Met Police began investigating a series of "gruesome" killings which initially began in the Croydon area in 2015, after Snarl raised concerns.The suspect became known as the "Croydon cat killer".Tony Jenkins, head of Snarl, said about 250 cats and a number of foxes and rabbits had been killed in similar circumstances since October 2015.He believes the same person - referred to by the charity as the "UK animal killer" - is responsible for all the deaths. "We see no evidence there's anyone else involved as the injuries are being replicated," he said. "It is possible - both geographically and because of the timings - for one person to be doing this. "This person is a very clever psychopath, he is forensically aware, avoids CCTV and might well travel as part of his job. "It is most likely Teddy was killed by this same person. "The Met launched Operation Takahe to investigate the links between animal deaths and last month experts at a new forensic lab in Surrey began re-examining some of the corpses for new evidence.